M. Night Shyamalan's least bad movie in years. To me, the biggest surprise about 2017's Split was that it revitalized M. Night Shyamalan's career. If it didn't quite return to full force (for has anyone ever been hotter than Shyamalan after The Sixth Sense? ), then it at least rehabilitated him to the extent that people felt comfortable saying his name without somehow integrating it into a punchline. Considering that Split is a rather drab affair—straight-up bad, since you asked, and not obviously superior to, say, After Earth—this truly was a genuine shock. It meant that the biggest surprise within its narrative could only be the second biggest surprise about the movie overall; this was that it turned out to have been a secret sequel to one of Shyamalan's very few universally-liked films, Unbreakable, all along. Which was never, to my mind, the best idea: Unbreakable is an exceedingly self-contained work, concerned mostly with deconstructing genre tropes, along with the fandom that celebrates them, and with creating feelings of mystery and discovery that were never going to be recaptured; in any event, for all that it plays with iconography, it's not actually about iconic characters, of the sort who needed to have their story continued even one second past their film's final frames. 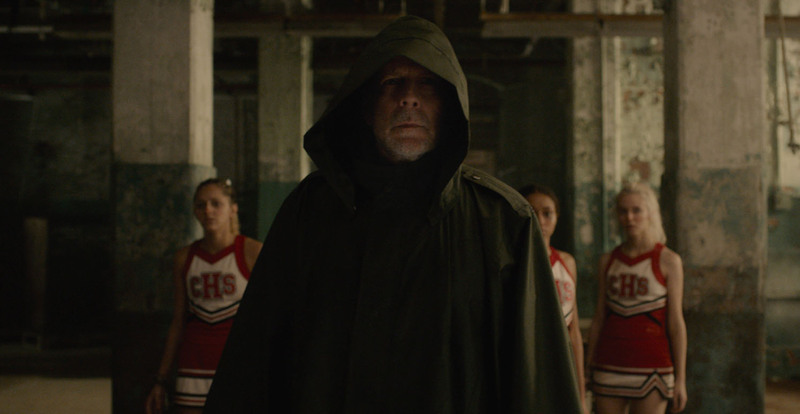 Well, not to say I told you so, but that nineteen-years-later continuation, Glass—a conclusion to a trilogy that was never really intended, even if Split's villain was, according to Shyamalan, supposed to have played a role in the sprawling, more ambitious version of Unbreakable he didn't get to make—proves I was right. Still, it's intriguing enough that I went into Glass wondering if maybe, this time, Shyamalan had finally made it back somewhere close to where he started. Almost, Night, almost. 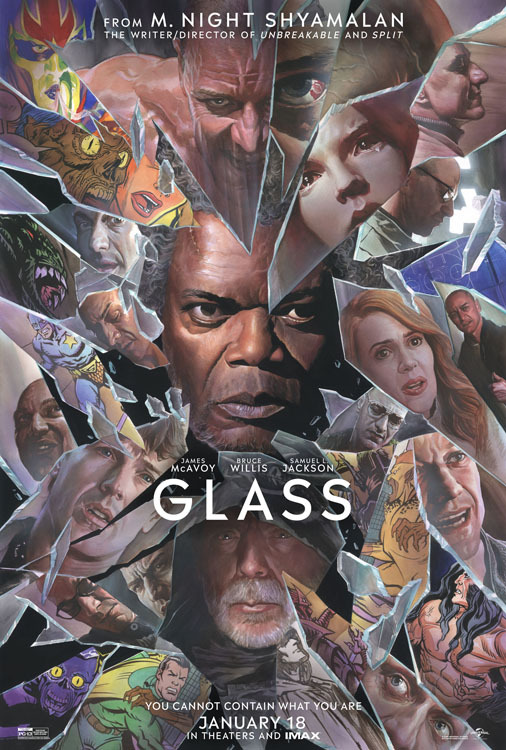 For all the disappointment that critics have expressed about it, I can't see any reason to claim Glass isn't at least a touch better than Split. That's not because it's any better-written, or even better-structured (it trades out pure numbing repetition for a whole lot of narrative wheel-spinning inside a dramatically-inert second act that swallows up most of the film, bookended by baffling but grimly-fun first and third acts). If it's better, then, it's simply because it's better-made, to the point that somehow that second act isn't boring (a veritable magic trick, considering that Glass is 129 minutes long, its second act is about 90 minutes long, yet somehow none of it feels excessive), and because it engages with its own ideas, and because it at least mixes things up in terms of tone and action, despite the somewhat-straitened circumstances it decides to throw its characters into. Hell, maybe it's just because a tale of lo-fi, street-level superheroics with a sense of finality about it was something I was in the mood for; and whatever else Glass does, its mash-up of two pre-existing casts means that it isn't another typical Shyamalan joint (Split, Signs, The Happening) where a bunch of extras suffer apocalyptic torments just to teach one or two protagonists a dumb lesson about themselves. On the other hand, "better than Split" doesn't make Glass "actually good." The ideas it engages with, it's fair to say, turn it into something along the lines of The Stupid Incredibles, though this is still giving it too much credit. Fairer yet to call it The Stupid Incredibles 2: a superhero story that takes superheroics so literally that it stops registering as being about anything but the concept of supermen fighting to make themselves known, but still insists upon itself as something more important. This is always suspect, since "literal superheroes demanding their due" is basically just "fascism," something Alan Moore and Grant Morrison realized before Shyamalan was out of high school, and while Shyamalan maybe feints in the direction of using his superheroes as totems for individual empowerment and harbingers of a new world, we're not exactly dealing with Flex Mentallo here, even if Glass (perhaps solely because Unbreakable and Flex are both about the power of believing in the unbelievable) recalls it. Also, if you, like me, look askance at the idea of "super-intelligence, rendered as being exactly as clever as M. Night Shyamalan," as a "superpower," then you won't be surprised if Glass's fundamentals are a little frayed, too. Glass has its "twists," and while it's unclear how much of this is being primed to expect twists in Shyamalan films, and hence whether it's fair to be judgmental about it, they do involve information that's deliberately withheld from the audience; and, as with Split's reveal of its "Beast," nothing Glass does in its third act has any hope of reorienting everything we've seen before in a bold new manner, because it's always been so obvious that it's simply the assumption we were operating under the whole time. Unlike in Split, though, it probably shouldn't even be surprising to anyone inside the movie, either. But first we have that aforementioned grimly-fun first act, in which David Dunn (Bruce Willis), having discovered his superhumanity over the course of Unbreakable and subsequently devoted himself to crimefighting, goes after Kevin Crumb (James McAvoy), whose dissociative identity disorder has manifested in the form of 24 separate personalities and a penchant for kidnapping and eating teenage girls, and whose ravenous 24th personality, as we learned toward the beginning and/or the end of Split, is not just "The Beast" in name, but bears mighty powers himself. (Yes, Shyamalan is still deeply enamored with his ability to climb on walls. Dude must have jizzed himself over Spider-Verse.) Their battle concludes with both tired opponents walking into a trap set by Dr. Ellie Staple (Sarah Paulson), a psychiatrist who specializes in subjects who have deluded themselves into believing they have superpowers. From there, David and Kevin are rendered to an insane asylum where they join David's old nemesis, the super-intelligent Elijah Price, but preferring his nomme de guerre, "Mr. Glass" (Samuel L. Jackson). Now all together, Staple subjects them to a barrage of "therapy," intended to show them that, actually, they're not so super after all. This is where Glass just kind of stalls out narratively for a long time, with lies being thrown at the characters and at the audience that are facially absurd (especially for David, who's been living with his superhuman talents for nineteen years, and whether or not Dr. Staple wants to quibble about what constitutes "superpowers," he's been a vigilante with a uniform that entire time; if David's not objectively a superhero, then what do you call Batman?). It probably doesn't help that when Staple's locked David in an armored room, she's seen fit to David-proof it with a sprinkler system ready to exploit his weakness to drowning; a very curious expenditure, if David's superpowers are not real. There's a counter-majoritarian reading of this I've come across; basically, that Glass is about gaslighting, that is, being attacked with obvious lies over and over as a form of power play and brainwashing, rather than being tricked in a conventional manner. It doesn't remotely play that way in the film itself. (Meanwhile, Glass could've gone somewhere incredibly weird if Unbreakable and Split somehow were delusions, but I have no idea how any screenplay could manage that.) Anyway, it's definitely overthinking what is explicitly laid out as a "comic book plot," for this is also where we run headfirst into the fact that despite Shyamalan's desire to create a grounded, Philadelphian world, he just doesn't know or care to know how anything whatsoever works, including courts and mental hospitals, and passes that disinterest in credible logistics onto his characters—it's amusing that one of the charges Staple makes against David is that he denies perps their due process rights, but it's not like we get to see him exercise any of his. Then again, as Willis seems entirely content for the vast majority of his performance to do nothing besides sitting quietly in a chair and staring in one of several pre-set directions, perhaps this even arises from his interpretation of the character. Glass does better by its other two headliners, which is remarkable given that it's well over an hour in before Jackson gets to do anything at all besides loll his head in sedated fog—even speak his first line of dialogue. But he makes up for lost time once his evil nerd gets his brain back (Elijah is arguably the most against-type major character Jackson's ever played, and he still plays it very well), and eventually Glass's villains get to be a whole lot more active. It's even more gratifying when it comes to Kevin, and McAvoy's inordinately gimmicky performance thereof: probably the least-likeable thing about Split, besides being 70 minutes of story stretched out over 117 minutes of movie, was that it knew its biggest draw was McAvoy playing cartoon multiple personalities, but didn't really offer more than three or four; Glass provides a much broader stage, with an in-story conceit that requires McAvoy to shift dozens of times throughout the film, and at least five times over the course of one single take. As Kevin continually attacks the hypnotic light that blasts him from one alter to another, McAvoy slides in and out of his several characters' silly voices and sillier body languages with astonishing smoothness. If I were to say the biggest jolt of joy in Glass's whole runtime is the closing crawl that credits McAvoy with all 24 of Kevin's alters in a big, hilarious vertical block, I would not necessarily mean this as a bad thing. In any case, it uses Jackson and McAvoy far better than it does anybody else, except maybe Paulson (whose calm plastic frowns of professional sympathy do more to convince you of the movie's plausibility than anything in its script, especially the dialogue Paulson gets to read). Glass also brings back other Unbreakable and Split actors to support the three leads, notably Anya Taylor-Joy's Casey; she's in it more than the reviews let on, and the consensus take, "she gets nothing to do," would actually be an improvement. Instead, what Shyamalan gets up to with Casey comes off as a response to the criticism Split suffered regarding the way the story seemed to take the Beast's side. That response, basically, is "Yes! That's exactly what I was going for! ", and Taylor-Joy gets the incredibly thankless task of playing helpmeet to the monster who ate her acquaintances, a task she fulfills by possibly playing the part too well, so sensitive to the material that you are constantly aware of its innate grossness. But that leads us down an unproductive rabbit hole of wondering whether Shyamalan misreads his own movies (Glass subtly repositions the villains of both Split and Unbreakable as evils more necessary than one may find appealing, without actually engaging even slightly with the moral questions this raises); so let's not. It's Shyamalan the Director who saves Shyamalan the Writer over and over again, in the ways I've mentioned, as well as in just making a really fine moving picture, with thoughtful and well-considered compositions that give the film a whisper of heightened reality, but no more, with strong attention to color and coding that color, with expectant, magisterial editing, and with frames within frames, if not so obviously that you can say "it looks like a comic book." The action is kind of great, terrifically small-scale like you might imagine a superhero movie might've been made in the early '80s; thumbing its nose at the superhero blockbusters of today, Glass promises a battle in the sky, and ends with a wrestling match in a parking circle instead. It reminds me, if only in some very general ways, of Scanners. I kind of loved that, and the general handicraft vibe of it: knowing Shyamalan self-financed Glass to the tune of $20 million, you're forced to admire his commitment, even if you're also annoyed that someone who hasn't been good at his job for almost two decades has $20 million in the first place. So: Glass is drunk on its own misplaced sense of self-importance, it doesn't expand its universe anywhere nearly as much as it thinks it does, and the modal dialogue in the thing is a lecture on the structure of superhero comic narratives as written by someone who does not appear to have read or understood superhero comic books in any systematic or critical way ("it's the final showdown at the end of a limited edition" is a phrase that gets used, and as someone who has read and understood superhero comic books in a systematic and critical way, I can tell you that its meaning is barely parsable, and it doesn't become more parsable just because Unbreakable was prone to malapropisms, too). But it's the best bad Shyamalan movie there is, anyway—I giggled at its many ineptitudes while being consistently surprised by its competencies. Often enough, I'm positive it's being willfully goofy, like when, during the parking circle showdown, it lifts a joke from, of all the damn places, Monty Python and the Holy Grail. (Not the Black Knight, though: the worst part of Shyamalan's self-financing scheme is that he's much too scared to do an R, not that The Happening really suggests he knows what an R is for.) I almost enjoyed its awful arrogance, too, because even if the biggest part of what's so bad about Glass is that Shyamalan's reach once again exceeds his grasp, comically and contemptibly, virtually every single time he tries, this time he at least allowed me to appreciate the earnestness of his efforts. Walt Disney, part VII: Won't you be our neighbor? Predator Week, part III: Space what now?